Only 25 years ago, the California condor went extinct in the wild. After the last 22 to be seen had been rescued and taken into captivity, a project was launched to save the birds and help them back into the sky. As new generations were born, they were carefully raised and returned to the wild in small groups where they could be watched over and where they could start new families. Deep in red rock country, just to the north of the Grand Canyon, an egg has just hatched, and today a California condor chick is 1 week old. It’s cause for celebration. The new chick is the 13th to be born in the wilds of Arizona, and one of 74 to be flying high in these remote canyons. Altogether, there are now 194 condors in the wild and another 181 in captivity. The latest lucky chick appears to have three parents, with one mom and two dads sharing the work of feeding and caring for the newborn. Biologists with the Peregrine Fund say they’ve never seen this before, but it’s all good news for the baby. Especially since it takes three years before a condor chick is ready to thrive on her own. A condor pair raises their chick on a rocky ledge among the Vermillion Cliffs of Arizona. It takes three years for a chick to grow up and be self-sufficient. 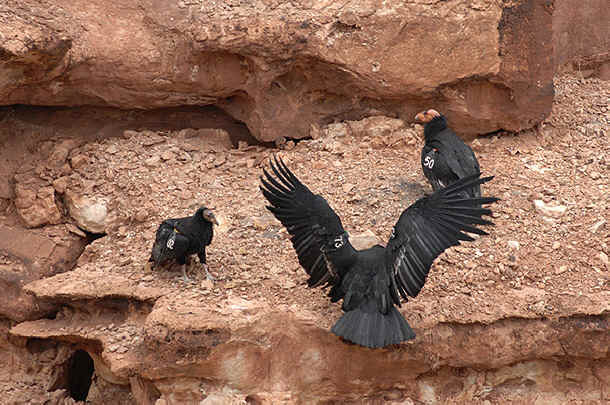 “Each wild hatchling gives us confidence that condors are well on their way to recovery,” said Chris Parish, condor project director for The Peregrine Fund in Arizona. 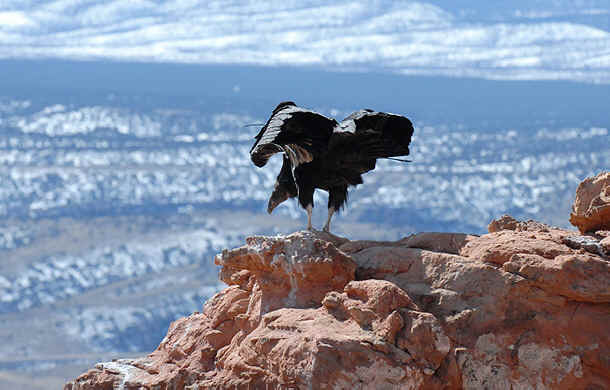 Condors are scavengers, rather than hunters. In Arizona, the birds sometimes stray from their isolated locations and land at famous natural monuments where tourists are having lunch and where the birds can get hit by passing cars. Peregrine Fund staff are quickly dispatched to pick them up and bring them back to their cliff homes. But the biggest threat to their survival is lead poisoning. The birds feast on the carcasses of animal like deer who have been shot by hunters. They are then either poisoned themselves by the lead, or their eggs are too fragile to come to term. Three years ago in California, where other wild populations of condors are being nurtured, Governor Schwarzenegger signed a bill into law banning the use of lead shot near condor habitats. In Arizona, an effort to do the same thing has been thwarted by the National Rifle Association. But other conservation-minded hunting associations have bucked the NRA, coming together to ban lead shot among themselves. Parish calls this “a celebration of conservationists, environmentalists and hunters that can be a success story for everybody” – most of all the magnificent birds who are getting a new lease on life. What you can do? The Peregrine Fund is working hard to save the California condor. Follow their work and support the cause.